Who remembers that Noreaga pigeon skit from Melvin Flynt Da Hustler? Yes, a 90’s hip hop reference (get used to it). Nore explains, “Pigeons would be thugs” if they were human and I would probably have to agree. For some reason, I’ve always liked to photograph pigeons. Love them or hate them, the streets of Toronto just wouldn’t be the same without these stout-bodied birds. They are bold and brazen, and if you find a big enough flock you can get some very cool urban shots. Now, I get a lot of questions on Instagram about my technique, approach and overall philosophy when it comes to photography. I try to answer as many as possible but inevitably miss a few here and there. I posted a shot a few weeks back and I got a lot of questions, so I thought I would share some insight on how to achieve the so-called “perfectly timed" shot. From my experience, it comes down to three things; preparation, patience and a bit of luck. Preparation: If you’re using a DSLR, make sure your camera is on continuous mode and shoot with a fast shutter speed (1/2000s-1/4000s) to “freeze” the action. If you’re using a mobile device, ensure you use burst mode so you capture as many frames as possible Yes, it’s possible with a mobile (here and here). Now, if you’re really serious about getting your shot, you can go all Home Alone 2 and bring a handful of seeds or bread crumbs. This will guarantee they go crazy but it also means your hands are preoccupied. If you have someone helping you out then great, but, more often than not I’m either shooting solo or not really planning on a pigeon shootout. Patience: Birds, especially pigeons, are very unpredictable. One minute they are on the ground milling about and next minute they scatter and relocate. With that said, you need to approach slowly and make them get use to your presence. 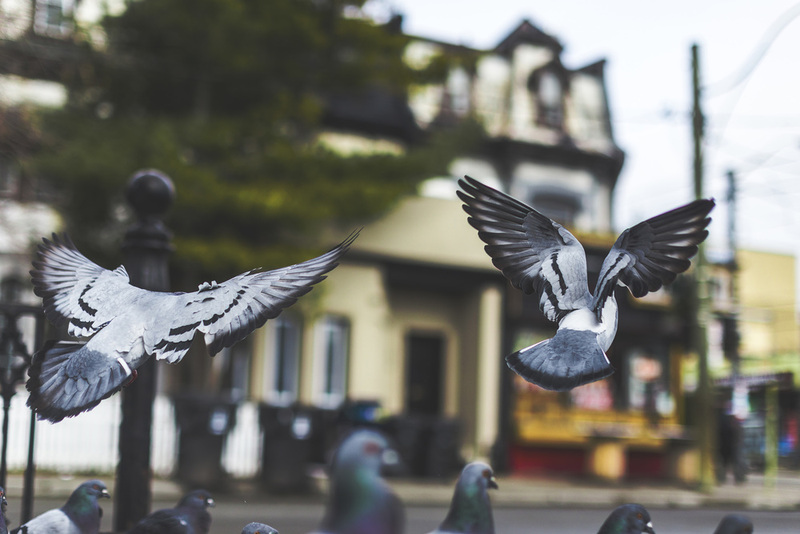 Pigeons are pretty use to humans but any sudden movements could scare them away before you even get a shot off. Once they are comfortable, begin snapping! So how do we incite frenzy? That’s the million dollar question. Like I mentioned above, you could “cheat” and throw seeds but if you don’t want to go that route, it’s usually a loud noise (truck, car horn, dog bark etc.) This is where patience and preparedness are key. You don’t know when it’s going to happen, but rest assured it will happen. I was pigeon whispering for close to an hour and managed to capture a few decent shots until I hit the jackpot . So, yes, it takes time. Luck: Remember when I mentioned luck? Well, after about an hour a guy randomly pulled up, went into his trunk and threw a handful of bird feed everywhere! Chaos naturally ensued and the end results are below. In the end, there’s no exact science to this but there are a few things you can do to increase your chances of creating a great photo. I could have easily been there for another two hours or I could have spent only 10-15 minutes before I got the shot. Either way it’s going to take preparedness, a bit of patience and some good old fashion luck. As always, comments and feedback are welcomed.